Britain's automated parking and traffic fines system has been branded "close to theft" and "medieval" by a Tory peer. 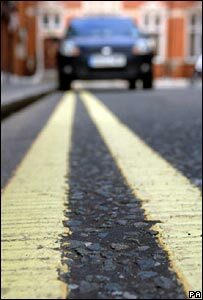 Of the millions of drivers fined per year, fewer than 1% appeal - many over incorrect road markings. About half of such appeals are upheld. In such cases, councils have no duty to contact and refund other drivers fined wrongly in the same place - which Lord Lucas told the BBC was "exploitation". However, the Department for Transport says the rules are fair. Lord Lucas, who chairs the Enforcement Law Reform Group, told the BBC Radio 4's iPM programme: "It is something that seems to me to be close to theft and it probably would be adjudged as theft if one could ever get it to court." When pursued over fines issued incorrectly for reasons such as illegal bus lanes, incorrect box junctions or wrongly delineated parking bays, local authorities "just refund the fine and then you have no course for action", he said. "So it is extremely difficult to get local authorities to behave properly on this. "There doesn't seem to be an ombudsman who will take this seriously and central government really just treats this as part of the tax-raising system." He said recent changes to the rules, which say local authorities should not use the system of fining people and parking enforcement to raise revenue, were not being enforced. "There is no way in which central government checks that this is what local authorities are doing," he said. "This way of raising revenue, this medieval fashion of taxation, really upsets people cumulatively and makes them less compliant citizens." But Nick Lester, corporate director of services for London councils, said the system did work. "We know that less than 1% of all penalty charge notices issued are challenged, and of those about half are upheld. That suggests that the system is 99.5% right." The Department of Transport said the rules were fair and that it had recently provided new guidance to local councils regarding the use of CCTV and traffic cameras. But barrister Oliver Mishcon says he believes local authorities who find they have issued a fine incorrectly have a "legal duty to take steps to repay revenue based on the same mistake". "But many parking services departments have been behaving as though they are above the law," he told the BBC. The number of penalty charge notices in England & Wales rose between 2005/6 and 2006/7, from 4,856,934 to 4,914,547. Local authorities collected more than £173m in penalty charge notices in 2007, up £12.5m on the year before - a rise of 7.7%.